Fishing for panfish is fun. Panfish can be caught easily by beginners and are excellent to eat. While most panfish use some kind of cover, eat similar foods and can be caught using similar methods, there are differences between species. The following tips will help you become a better panfish angler. Remember, you can help maintain good quality panfish populations in your favorite lake or pond by only keeping the fish you intend to eat. 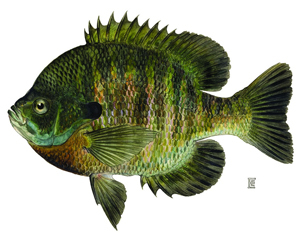 Sunfish (bluegills and pumpkinseeds) can be found around all types of structure, including weeds, rocks, brush, docks, and overhanging branches. Smaller sunfish form large schools and will bite quickly. Larger sunfish (8-10") usually are loners or may form small groups. They tend to be deeper than the smaller ones and are a little more finicky. A good rule of thumb is if you do not get a bite in 5 to 10 minutes, move to another area. Many bait and lures are used to catch sunfish. Live baits; such as crickets, grasshoppers, earthworms, grubs, and waxworms; work very well. These baits can be threaded onto a #8 or #10 hook and fished just over or next to structure. Small spinners, flies, poppers and jigs are all good choices for catching larger sunfish. Jigs and live bait can be fished slowly under a bobber over weeds or under overhanging limbs. Fishing slow is the key to catching sunfish. They generally bite better in the morning and evening, but they can be enticed to bite all day long. Fishing for crappies can also be very enjoyable and productive, provided you do it in the spring before crappies spawn. At this time they can be caught easily around weeds and brush. The best way to catch crappies is to fish in 3' - 6' of water with small jigs or minnows suspended under a small bobber. Worms, spinners, flies and small topwater lures will also work. Live bait can be used on a #6 hook. Fish all baits or lures slowly. Once a crappie is hooked, the line should be kept tight because their mouths are soft and tear easily. If slack line is given, you may lose the fish. 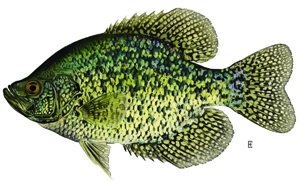 During the heat of summer, crappies tend to suspend over deeper water. They may come to the surface to feed at dawn, dusk, or even during the night. When this happens, fishing is very good for a very short time until they mysteriously disappear. Yellow perch do well in a variety of waters. However, lakes with a good predator population and a few weeds will produce larger perch than lakes with many weeds and few predators. Perch can be caught on small minnows and worms fished on a #6 hook or on spoons, jigs, spinners and flies. The key to catching perch is keeping your bait near the bottom. Bobber rigs work well, but you may also want to try using a bottom rig with two hooks or vertical jigging. Castmasters and Swedish pimples tipped with waxworms work well for jigging. Once they start biting, get your line back in the water quickly because the increased action will create a feeding frenzy. Perch school by size. If all you catch are little ones, try moving to a different area or deeper water. Bullheads, unlike most other panfish, are bottom feeders and are generally not associated with structure. Spring and summer are prime seasons for bullheads. The best way to catch bullheads is to use doughballs, nightcrawlers, or chicken livers on a #4 or #6 hook fished on the bottom. Best fishing tends to be in the evening or at night. There are three basic techniques used for bottom fishing. If the bullheads are close to shore or in shallow water, just add a couple of splitshot to the line. Another set-up involves tying the sinker on the bottom and the hook 8" - 12" above the sinker. The third way is the slip sinker method shown on the front cover. For more information, visit the NYS Department of Conservation website.